I hate to admit it, but I've been stamping for over 6 years and until yesterday I had never done wax paper resist. I really don't know why, well maybe deep down I just didn't want to drag out the ironing board and iron. Then I'd have to admit that I own those things..LOL! My friend, Rhonda, hosts Technique Tuesday over at Stampin' Addicts so it was time for me to try out this fun technique. When I saw Rhonda's sample, I immediately thought that the background looked like animal skin. So, I pulled out Wild About You and set to work. All products from Stampin' Up! except wax paper! 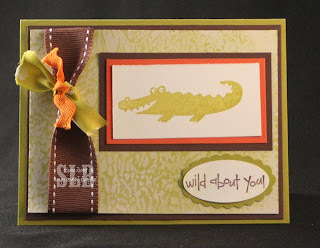 PS--Check out the new Stampin' Up! Occasions Mini catalog, click the picture on the right to see the fantastic new products now available for order!